It seemed as if Hell would freeze over in frozen yogurt before this happened, but after months of anticipation, Spoon Me loot is finally for sale online. 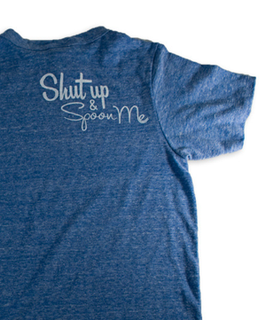 Now you can buy your own “Shut Up and Spoon Me” t-shirt and stop trying to steal mine. As most of you know (because we talk about it every chance we get), Eat My Words named Spoon Me, which has become the hottest frozen yogurt franchise on the planet. Check out the Spoon Me store to see all of the stylish fashions.